Library Services are available to all residents of Union Springs and the immediate surrounding areas. Summer residents are also invited to become acquainted with the library and its offerings. The patron’s responsibility is to return materials by the due date. Books may be renewed by phone or on-line and the library offers auto-renew service. Reimbursement is expected on lost or badly damaged materials. The library collection includes fiction and non-fiction books, and a fine children’s section. There are also paperbacks, magazines, and videos. As part of the Finger Lakes Library system, the Springport Free Library can offer Inter-Library Loan, Large-Type books, Books-on-Tape, and a Mail-It program offering books, cassettes, and Large-Type books for the homebound. Applications for New York State Library for the blind and Visually Handicapped Talking Books Service are also available. Community Programming is scheduled throughout the year. Story hours for children are presented during the summer, and programs for preschoolers are held during the school year. Users under 18 must have a parent or legal guardian co-sign this form. Users may print up to two pages from the computer without charge; a charge of 15 cents per page will be required for any additional pages. Patrons are reminded that the library’s computer terminals are located in public areas, which are shared with others. Individuals are expected to be considerate of others and not access offensive information or images. World Book Encyclopedia and other off-line information retrieval sources, such as trip planning, answers to medical questions and an atlas. The Internet and World Wide Web– there will be no general access to e-mail through this system. The fax and copier machines are available for the public’s use. Copies are fifteen cents per page, both sides. In 1898, a small group of civic-minded people formed an organization. The first meeting of the Trustees was held on October 24, 1898, and Union Springs’ first library was established in a single reading room above a village business. This room was open every evening and three afternoons a week. 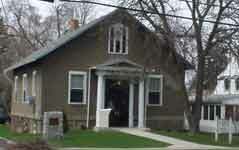 In November of the same year, an application for a State Charter was sent to Albany, and the next month the State Inspector of Public Libraries, approved the library, and declared that “a haven of refuge had been established.” In 1902, the library was given a State Charter and the name Springport Free Library. The next step was for the Springport Free Library to move into its own building. So on June 15, 1910, the Library Association bought the Quaker Friends Meeting House for $450. Renovations were needed, and several fund raisers were held to raise the necessary funds, including concerts, lectures, and suppers. When the renovations were finished, volunteers moved in the furniture and books, and in a mere two days, everything was ready for the grand opening. On December 31, 1910, the library was formally opened to the public, complete with an afternoon tea. The library became a charter member of the Finger Lakes Library System in 1958. Now the resources of all the libraries were open to the patrons of each library, and professional assistance was granted so that book, record, and painting collections became available. From the Bicentennial History of Springport and Union Springs, New York 1976.